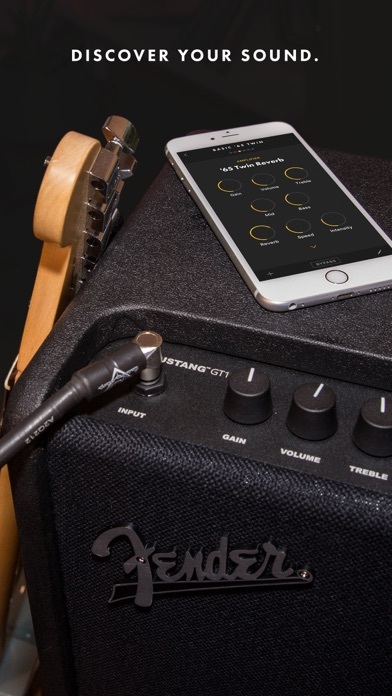 The ultimate companion app to the new Fender® Mustang™ GT and Rumble™ Stage and Studio amplifiers, the Fender Tone app uses your iPhone to connect to your amp, so you can edit, share or send presets to your amp wirelessly over Bluetooth®. *** THIS APP REQUIRES A FENDER® MUSTANG™ GT OR RUMBLE™ AMP *** MANAGE PRESETS ON YOUR MUSTANG GT AMP OR RUMBLE AMP • Scroll through up to 200 presets. • Make changes. • Play it real-time through your connected Mustang™ GT or Rumble™ amp. 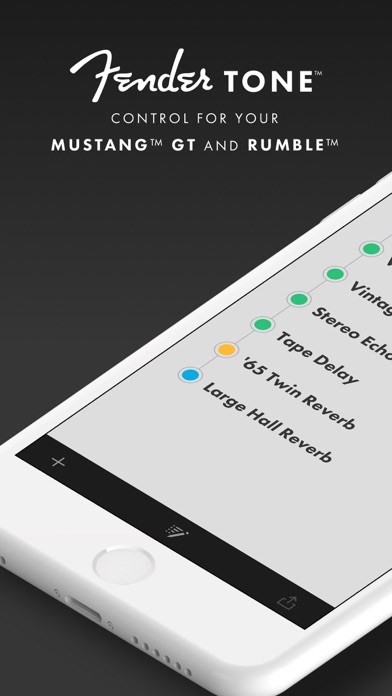 EASY EDITING WITH THE TONE APP • More than 60 amp models and effects to choose from. • Endless sound options for Mustang™ GT or Rumble™ amps. • Intuitive interface & responsive design for easy modification. 10,000+ PRESETS • Search, browse and download over 10,000+ presets from the Tone community. • Discover presets by well-known artists & players created exclusively for Fender Tone. 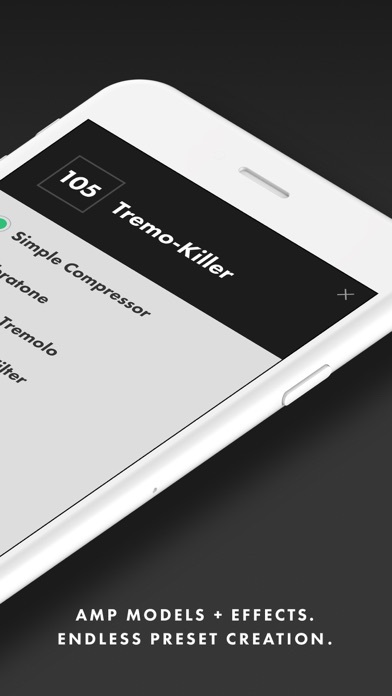 • Create your own custom tone and share your presets with others. TONE TIPS • Tips and info about amp models, effects details, and signal chain basics. 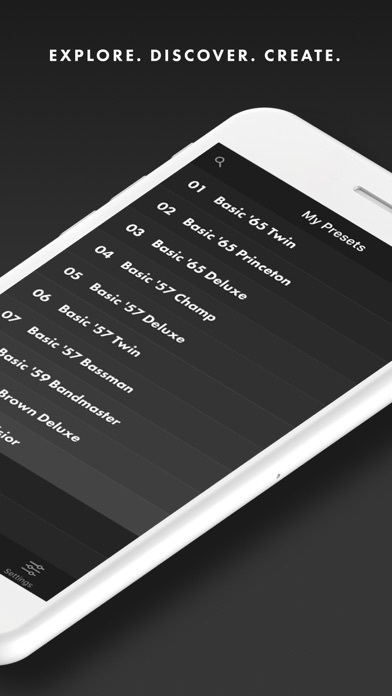 • Clear, illustrated walkthroughs and everything you need to begin your tone quest. The app would be great in my eyes if it just worked reliably. I don’t get the same disconnecting issues but the glaring thing to me is the presets on the app sometimes do not match the amp. At times I can’t tell to trust the app or amp (but I do lean on just checking the amp). It’s very weird if you try to edit one of the erroneous presets in the app because it’ll sometimes miss the fx of then preset on the amp. Either way that is weird so please fix it Fender. I like the app so I cm easily scroll through the library of presets - it’d be great if it matched the amp 100%. Needs more intricate settings more similar to fender fuse. Noise reduction, chain effects, a computer to use with it. #1 in my book if it stays Free! It’s comparable to a Xbx or Px4! The app is super easy, to find songs, artists, & classic amps! It’s like downloading 50k in amps! And all the pedals! And effects. Have two of them. The Mustang and Rumble hold 200 tones. 100 come preloaded. The ‘65 twin reverb.. to everything! *we can add any effect or pedal tone. Before and after, as well as doubled pedals. Like SRV and his two tube screamers. Or just the Tone on the phone and pick most his songs ya had probably thought of. Or just his tone and build the tones ya save. The is a set list. And faves. Or learn songs that ya see for a show better than ever. Too easy to use ya may just be embarrassed to admit. *The amp and app have made easy friends! *Best SOCIAL APP that I can really say it helped me meet others. “we made music together” “The neighborhood heard.” Ok enough of the fun and games. It’s far better than the only negative to the set. Only pedal offered at this time. I called Fender to complain to have better ones soon. We will see. The foot-switch that makes the set is extra.... unless it’s with Mustang GT400. *it only loops for one minute, nor capabilities of the current loop pedals, a tuner is in the pedal though, but again, it needed pedal to activate the tuner in amp? Updates may have addressed that. *there was a period it was free. And then the app cost a rather steep price. Now it’s free again last I used it. Note: if ya have first models like me. The Rumble had to use micro cable to a computer. Not to the phone. I won’t tell ya how many I’ve sold probably. It’s kinda my pride and joy.. Ha! Song is a click away if the official sounds the Tone App has. Let’s just hope it will be Free! It will make the pedals..the past. *I’m a regular guy, and I can’t play like my friends. I’m ok. ...but I’ve seen so many pedals in the past they wanted, that I just played acoustic for as long as I could. They would carry a mess of them to play on the tubes. Now... it’s just so much fun and simpler.. I didn’t write this much in school! The Tone app and amps... ... over the last year, Are that much fun! Have the patience to do any upgrade. The rest is easy!!! Presets are great!!! So many possibilities!!! I have had no issues setting this amp up from firmware updates to Bluetooth streaming. I haven’t created setlists and it sounds like there may be some frustration there but for just practicing and finding a tone you like, this amp is s much fun. I did use it at a gig a couple of weeks ago and it was smooth sailing for me! In theory, the Fender Tone app should be a welcome companion to the GT series. However, the implementation is fatally flawed. When adding pre-sets to a “favorites“ Setlist, certain presets were renamed and re-numbered. For example, I attempted to add “Basic Vibrato” # 24. The app somehow decided to add “School’s Out” # 45“. When I tried to delete “schools out“ from my favorites, it warmed me that I was going to delete Basic Vibrato. Clearly there is something going on with the sorting in the database, and this phenomenon is not limited to the example above. Somehow the preset list has been corrupted… Not sure if this is app related or application related, but it renders the app (and the usability of the amp) virtually useless to me. I do hope the developers fix this soon. This combo of amp and app has so much promise. What a difference to be able to have built-in presets that change your Rumble 800 Stage bass amplifier to match the most popular amplifiers of all time in history. It like have a bunch of different bass amplifiers in your studio and switching from one to another on the fly with the turn if a knob. Then on top of that having the ability of creating your own sound that you created yourself. Forgot all those pedals you used to carry around and use the amp to build your own pedals that are like the classics of the past. Included is a multi function 4 button floor pedal that does looping and effects that you program yourself. Plain and short now you have a modern Bass Amplifier that can do pretty much anything. I love controlling the amp but it’s annoying when the app updates and then I can’t controll it with the app after going through the manual amp update process but when its connected zip zap zoom im in there! I think that the only thing that this app needs is an update where this app can be used with any Fender amplifier.My amplifier is a Fender Frontman 15G, which came with my Fender Squier Strat electric guitar as a Christmas present from Santa. By I HATE THIS GAME!!!!!!!!!!!!! Great app. It’s a very easy way to set up sounds on your Mustang GT. It needs iPad compatibility though. If I’m playing out, I want to be able to use the iPad clipped to my mike stand! I am so proud to own this GT-100. I would have never believed that a Amp could do so much. I’m 58 yrs. and have been playing guitar since I was 10. I have recently decided that it’s time for me to learn how to play lead. And that’s why I bought this amp. The technology on Fenders Amp is simply unbelievable. I prefer southern rock you should here this amp playing train train by Blackfoot. Or Tuesday gone with the wind LS. I have already learned lead on black magic women. I salute the Fenders Engineer s designers and all of there employees! Well done. It okay but it needs to have the interface like the amp itself. When I open the app there should be a better interface like what is on the amp before I go to make changes. It’s as if I’m already in the menus when I open the app. Being able to see all the current settings to start and then being able to tweak just what I want from that interface again like the interface on the amp would make much more sense. I was very excited to see the 2.0 firmware update for the Mustang GT as I love this amp - when it works. Unfortunately, the amp has a habit of cutting out randomly during use. It will behave briefly as if a noise gate's threshold is raising, until it overtakes all sound from the guitar. Then volume just seems to decay until it's entirely give. Sometimes changing the preset, and then changing back temporarily fixed things.. sometimes it doesn't, and you need to restart the whole amp. Very frustrating, and totally unusable for a live performance. Fender, please please fix this bug so this amp and Fender Tone can live up to its 5-star potential! The Rumble amp is AMAZING. This app on iPad... Amazingly terrible. It is skinned using designs for the iPhone 4. It doesn’t have a landscape view. It randomly hangs in places it shouldn’t on an iOS device. It is obvious that the iOS app was an after thought. That is so disappointing since I use my iPad as an all in one performance device. If you have an Android device, do yourself a favor and use the Android version until they overhaul the iOS app. The amp has such great quality... why doesn’t the iOS app have the same. While this app gets the job done it's not intuitive and doesn't present a good workflow. Choose, set, save, share, receive ideas. Also, using it w/ Rumble 800 and Rumble Studio 40 I have a wealth of sought after rigs that require practically no maintenance and no need for large space to house them or large vehicles to lug them. Don’t have to be rich or be a star to have this much desirable equipment anymore. Awesome advancement for guitar playing. Would love to see a good iPad app that is nicely laid out. After a week and also using the Marshall code app this fender app could use some basic UI tweaks, particularly the knobs and the amp/fx pages. I like the mustang better but the app is hard to navigate particularly having to double tap the home button to bring the screen down to change the amp selection (without having to take both hands off the guitar to use the phone). App keeps losing BT connection - even when I’m still able to stream music, so I know it’s not a BT problem. Could not get a decent tone out of the amp. I prefer tubes, but wanted a fun travel / practice amp. Returned it a bought a Katana 50 - very satisfied. Works great until the app fails to sync correctly. When this happens, creating a new preset can overwrite an existing one with no warning or ability to undo. Decent amp but the companion Tone App makes it fantastic and a compelling force on the modeling amp landscape. I own the Mustang III v2 yet couldn’t resist the additional purchase of the new GT 100. After a couple years of perfecting Fender Fuse and still struggling to embrace it, The Tone App blows fuse out of the water and makes this whole tone control, tone presets and amp modeling thing fun again! Sorry Fender but yes, the Mustang III, V2 does have a slightly better sound and I wish GT was equal but it sounds good enough and with a little manipulation with tones using this amazing and easy to use app you can find your sound! My only requests so far for future release... 1. Preset back up in a cloud! 2. A quicker way while in a preset to save it directly to a saved “Playlist” (or several) vs saving the preset and having to go all the way back to a Playlist, finding the new tone and then adding it. 3. Adding Wah pedal functionality using the app vs going over to the amp Outstanding job Fender App team, keep up the good work and don’t abandon this like they did Fuse and can’t wait for future updates!!! This app is a powerhouse. So so many options and sounds. Only problem is the presets keep reverting to old ones every time I start the app. Support the original mustang modeling amp. The PC app is terrible, it was never good. You need to stand behind your product or open the APIs so developers like me can. Simple and intuitive app for managing the amp. The ability to search for tone settings online and push them right to amp is really cool. I’ve had to do alot on my end just to get the amp to work. Being that this is about just the app I’ll solely focus on the fact that it worked once.. and has yet to work again. I know my amp serial number by heart from the number of times I have been asked to reenter it. I have most current firmware, have reset all settings, I have reinstalled the app, restarting and restarting, I have an iPhone X on the most current software... nothing. Using all my powers of deduction I cannot find the cause... app or amp. At this point Im calling failure on both. Please get it together Fender. So much work to update firmware and it keeps complaint about update firmware even it is the most recent version of firmware. I am not sure actually how many percentage of fender mustang user utilizing full functionality. Customer support doesn’t have much knowledge about how to solve the problem about firmware upgrade and app function. Really regret that I spent money on this product. Please check the youtube before you buy this fender mustang gt series amps. Can anyone tell me why it won’t connect to my Tablet? Or at least what it is compatible with besides my iPhone? To the devs: Thanks for taking the time to read this comment. ———— My experience with the Fender Tone app has been mostly good to date. I didn’t purchase my GT Mustang until about a month ago, so I can not compare my current experience to the early releases of this app. However, based off the reviews left by users of the last few versions, it does seem like the team is actively addressing issues raised, which is extremely promising. The app itself is clean in design, and the UI is uncluttered. Finding what you need is extremely simple, and creating your own effect chains couldn’t be easier. There are a few UX tweaks that could be done here and there, but ultimately the app is coming together quite nicely. In using the app/amp over the past few weeks I’ve experienced a few hiccups, as well as thought up a couple suggestions for improvement. Those are listed as follows: ——— BUGS ——— 1) the app is constantly telling me to update the amp’s firmware, even though it is up to date. Extremely annoying to say the least. 2) going hand in hand with bug #1, sometimes the app refuses to send presets to the amplifies, stating that “an amp firmware update is required” to sync. Bug #1 is annoying, but this compounds the issue to make it borderline infuriating. 3) this may be resolved in this version, as I haven’t had to change WiFi parameters since the initial amp setup, but I was unable to configure the amp’s WiFi settings via the app. I tried multiple times to no avail, and eventually settled on using the amp’s own button/dial interface (as tedious as that was) to save the network SSID/Password and connect. ——————— SUGGESTIONS ——————— 1) The app should have a tutorial/walkthrough screen when launched for the first time. If it does, then I must have missed something, because it definitely did not discuss Bluetooth pairing and the difference between pairing via iOS Bluetooth settings and pairing in-app. 2) tying into #1, the differences in Bluetooth config (app/device settings) needs to be addressed on initial install. I spent way too much time trying to get my amp to play an accompaniment via BT, only to find out (after having to search fender.com for the Mustang BT FAQ sheet) that the amp needed to be paired through the phones settings menu to enable streaming 3) THIS IS MY BIGGEST DAILY GRIPE!! The tuner feature is great, but displaying a static screen on the app when tuning mode is activated feels cheap, lazy, and is super annoying. Making the user move themselves/guitar to the amp and stare at a tiny 1.5” screen that’s not even angled towards them is just plain stupid imo. I have a perfectly good screen right in front of me when launching tuner mode, as such the data from the amp should be mirrored in app while tuning. It’s such a minuscule amount of data (array with a string and an int: (s) note being played, (i) #semitones sharp/flat) that this shouldn’t be a problem. This would then open additional features, like being able to set custom tunings (drop d, just as an example) 4) search/user ratings on community presets needs some tweaking. I hate seeing presets that have hundreds of downloads, but no ratings. Perhaps prompting the user to rate a community preset after a set amount of time (15-30 minutes of use) via a non-obtrusive in-app modal would help gain more votes. Down voting would help as well, especially if there was a way to comment on why the tone doesn’t match/what could be tweaked. This could open some very interesting discussions and ideas, although adding in commenting ability also means having to moderate comments, so I understand if you all decide to just stick with an up/down vote model. 5) community presets should have an optional tagging system for band/album/song in addition to the genre-based category system. 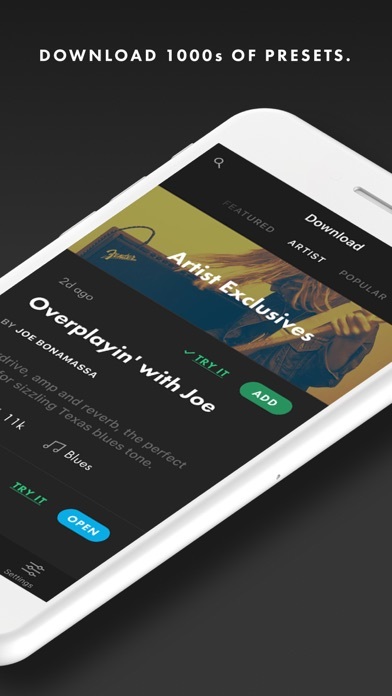 This would enable finer searching parameters, as well as better grouping, more relevant search results, and the ability to browse presets by band/album/song instead of relying on search. ———— Thanks again for taking the time to read this review - I know it’s a bit lengthy, but I would love to see some of these ideas addressed/implemented in future iterations of the app! My Bluetooth streaming has not worked since I first got it. It worked one time then never again after that. I purchased the GT 40 yesterday after much debate. I updated the amp and installed the app and got everything set up right away. The app works ok. The presets work great up to 25. Then when you try 26, it has 27 on the amp and continues like that for the rest of the presets. This is the exact same results on my android device. 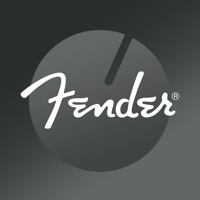 I understand and like what Fender is trying to do and I'm really rooting for them. They really need to focus on an update and fix this. By Read The Recent Reviews!! This update has rendered the app unusable. 1. App will not connect to amp. Troubleshooting was extensive. 2. Can no longer connect to wifi networks. In fact, the app only allows you about 4 seconds from clicking your desired network to have the password entered. Therefore, unless you've memorized your 36 character password, you won't get anywhere. Additionally, the same 4 seconds times out the app's attempt at connecting to the network. However, if you rehearse enough to be able to enter your password and press connect fast enough— you'll have the "unable to connect to network" prompt appear. 3. Amp firmware update can no longer take place. The wifi network has been removed from the amp by the app. The amp LCD screen is stuck on the loading screen, and attempting to connect to wifi manually only leads to the loading screen popping up again. Then proceeding to search for an update brings you back to discovering there is no wifi network connected. 4. Community presets no longer available to open on screen. This issue may be fixed once connecting to a network or the amp itself is more feasible. This is frustrating because my amp is now stuck on 1.0.38 with no wifi network, no community presets, no Bluetooth connectivity to the app, and no app connectivity to alter settings/check for updates/adjust levels etc. RESPONSE TO DEVELOPER: All you did is tell me to install it again. Like I said in my first point, my troubleshooting was EXTENSIVE. It has been a week and I can't say support has done anything to help. If Fender guitars worked like this app (and the amp it is for) they would be out of business. It only works with outdated wifi protocols so if you have a nice, modern internet setup you'll have to dummy down your settings. Nightmare! Can't even connect to my amp. I have Bluetooth on and I get to the last step but it won't pair. First off, I love the amp and was super stoked when I first purchased it. However upon applying the app I quickly realized (as stated by the other reviews) that the app is extremely buggy. Have to reboot constantly, none of the browse-able presets on the tone app grab on the amp, and signal cuts in and out. It's straight up unusable. If I could give it zero or negative stars I would. It doesn't function yet Fender is selling these units on the pretense that the app functions perfectly.. Boo Fender!! Please fix!! I like the concept and most of the execution of this app, but there are some key things to work on. 1. Selecting presets via the app usually selects one preset off of the one selected. 2. Usually after this, one or more presets will fill multiple spots in the list. The tones themselves haven't changed, but the names show duplicates in the list. 3. Deleting presets doesn't delete the space the preset is held in but rather removes all the settings leaving an "empty" spot. 4. The "My Presets" section just seems to fill itself with random presets. Nothing I've made or tweaked, as I've not yet saved anything. 5. It might be a good idea to be able to edit the My Presets list, including deleting presets from the list without having them be deleted from the All Presets list, as well (like what currently happens). 6. It might also be a good idea to just drop My Presets and replace with Favorite Presets or something. That way I can save any kind of preset, mine or otherwise, for quick access. 7. Bluetooth drops happen a bit too frequently. I've noticed more so when streaming music to the app while simultaneously using the Tone app. Once these rough edges can be smoothed out, this will be a great app. I was not able to set up a WiFi connection via the app; had to do it on the amp. Took several attempts to connect to Bluetooth before finally succeeding. Once that was all settled, the app seems to do its job. A phone-only app in 2017? There are no excuses for that. Great concept but it does not work. Have not been able to connect my GT100 via Bluetooth. Have tried everything; turning it off and on many times and nothing. Very frustrating!! I love that I can tweak my presets remotely with the app, but it clearly needs work. If Fender can resolve bugs quickly, this will be awesome and five stars...i like the simplicity and the ability to download presets from the community. Should not have been released. Communicates with amp about every fifth try . Go back to the drawing boards .